Russia and the West Have Conspired to Tear the Country Apart. Both Sides Must Stand Down Now or Face the Consequences. We’re now witnessing the consequences of how grossly both Russia and the West have overplayed their hands in Ukraine. It is urgently necessary that both should find ways of withdrawing from some of the positions that they have taken. Otherwise, the result could very easily be civil war, Russian invasion, the partition of Ukraine, and a conflict that will haunt Europe for generations to come. The only country that could possibly benefit from such an outcome is China. As with the invasion of Iraq and the horrible mismanagement of the campaign in Afghanistan, the U.S. would be distracted for another decade from the question of how to deal with its only competitive peer in the world today. Yet given the potentially appalling consequences for the world economy of a war in Ukraine, it is probable that even Beijing would not welcome such an outcome. If there is one absolutely undeniable fact about Ukraine, which screams from every election and every opinion poll since its independence two decades ago, it is that the country’s population is deeply divided between pro-Russian and pro-Western sentiments. Every election victory for one side or another has been by a narrow margin, and has subsequently been reversed by an electoral victory for an opposing coalition. What has saved the country until recently has been the existence of a certain middle ground of Ukrainians sharing elements of both positions; that the division in consequence was not clear cut; and that the West and Russia generally refrained from forcing Ukrainians to make a clear choice between these positions. During George W. Bush’s second term as president, the U.S., Britain, and other NATO countries made a morally criminal attempt to force this choice by the offer of a NATO Membership Action Plan for Ukraine (despite the fact that repeated opinion polls had shown around two-thirds of Ukrainians opposed to NATO membership). French and German opposition delayed this ill-advised gambit, and after August 2008, it was quietly abandoned. The Georgian-Russian war in that month had made clear both the extreme dangers of further NATO expansion, and that the United States would not in fact fight to defend its allies in the former Soviet Union. In the two decades after the collapse of the USSR, it should have become obvious that neither West nor Russia had reliable allies in Ukraine. As the demonstrations in Kiev have amply demonstrated, the “pro-Western” camp in Ukraine contains many ultra-nationalists and even neo-fascists who detest Western democracy and modern Western culture. As for Russia’s allies from the former Soviet establishment, they have extracted as much financial aid from Russia as possible, diverted most of it into their own pockets, and done as little for Russia in return as they possibly could. Over the past year, both Russia and the European Union tried to force Ukraine to make a clear choice between them—and the entirely predictable result has been to tear the country apart. Russia attempted to draw Ukraine into the Eurasian Customs Union by offering a massive financial bailout and heavily subsidized gas supplies. The European Union then tried to block this by offering an association agreement, though (initially) with no major financial aid attached. Neither Russia nor the EU made any serious effort to talk to each other about whether a compromise might be reached that would allow Ukraine somehow to combine the two agreements, to avoid having to choose sides. President Viktor Yanukovych’s rejection of the EU offer led to an uprising in Kiev and the western and central parts of Ukraine, and to his own flight from Kiev, together with many of his supporters in the Ukrainian parliament. This marks a very serious geopolitical defeat for Russia. It is now obvious that Ukraine as a whole cannot be brought into the Eurasian Union, reducing that union to a shadow of what the Putin administration hoped. And though Russia continues officially to recognize him, President Yanukovych can only be restored to power in Kiev if Moscow is prepared to launch a full-scale invasion of Ukraine and seize its capital by force. The result would be horrendous bloodshed, a complete collapse of Russia’s relations with the West and of Western investment in Russia, a shattering economic crisis, and Russia’s inevitable economic and geopolitical dependency on China. But Western governments, too, have put themselves in an extremely dangerous position. They have acquiesced to the overthrow of an elected government by ultra-nationalist militias, which have also chased away a large part of the elected parliament. This has provided a perfect precedent for Russian-backed militias in turn to seize power in the east and south of the country. The West has stood by in silence while the rump parliament in Kiev abolished the official status of Russian and other minority languages, and members of the new government threatened publicly to ban the main parties that supported Yanukovych—an effort that would effectively disenfranchise around a third of the population. After years of demanding that successive Ukrainian governments undertake painful reforms in order to draw nearer to the West, the West is now in a paradoxical position: If it wishes to save the new government from a Russian-backed counter-revolution, it will have to forget about any reforms that will alienate ordinary people, and instead give huge sums in aid with no strings attached. The EU has allowed the demonstrators in Kiev to believe that their actions have brought Ukraine closer to EU membership—but, if anything, this is now even further away than it was before the revolution. In these circumstances, it is essential that both the West and Russia act with caution. The issue here is not Crimea. From the moment when the Yanukovych government in Kiev was overthrown, it was obvious that Crimea was effectively lost to Ukraine. 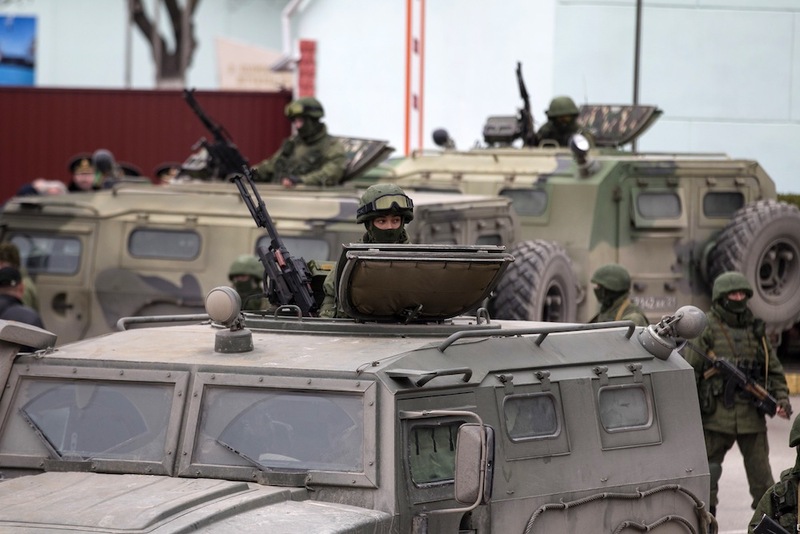 Russia is in full military control of the peninsula with the support of a large majority of its population, and only a Western military invasion can expel it. This does not mean that Crimea will declare independence. So far, the call of the Crimean parliament has been only for increased autonomy. It does mean, however, that Russia will decide the fate of Crimea when and as it chooses. For the moment, Moscow appears to be using Crimea, like Yanukovych, in order to influence developments in Ukraine as a whole. It also seems unlikely that the government in Kiev will try to retake Crimea by force, both because this would lead to their inevitable defeat, and because even some Ukrainian nationalists have told me in private that Crimea was never part of historic Ukraine. They would be prepared to sacrifice it if that was the price of taking the rest of Ukraine out of Russia’s orbit. But that is not true of important Ukrainian cities with significant ethnic Russian populations, such as Donetsk, Kharkov, and Odessa. The real and urgent issue now is what happens across the eastern and southern Ukraine, and it is essential that neither side initiates the use of force there. Any move by the new Ukrainian government or nationalist militias to overthrow elected local authorities and suppress anti-government demonstrations in these regions is likely to provoke a Russian military intervention. Any Russian military intervention in turn will compel the Ukrainian government and army (or at least its more nationalist factions) to fight. The West must therefore urge restraint—not only from Moscow, but from Kiev as well. Any aid to the government in Kiev should be made strictly conditional on measures to reassure the Russian-speaking populations of the east and south of the country: respect for elected local authorities; restoration of the official status of minority languages; and above all, no use of force in those regions. In the longer run, the only way to keep Ukraine together may be the introduction of a new federal constitution with much greater powers for the different regions. But that is for the future. For now, the overwhelming need is to prevent war. War in Ukraine would be an economic, political, and cultural catastrophe for Russia. In many ways, the country would never recover, but Russia would win the war itself. As it proved in August 2008, if Russia sees its vital interests in the former USSR as under attack, Russia will fight. NATO will not. War in Ukraine would therefore also be a shattering blow to the prestige of NATO and the European Union from which these organizations might never recover either. A century ago, two groups of countries whose real common interests vastly outweighed their differences allowed themselves to be drawn into a European war in which more than 10 million of their people died and every country suffered irreparable losses. In the name of those dead, every sane and responsible citizen in the West, Russia, and Ukraine itself should now urge caution and restraint on the part of their respective leaders. Anatol Lieven is a professor in the war studies department of King’s College London and a senior fellow of the New America Foundation. He is author of Ukraine and Russia: A Fraternal Rivalry. *Photo courtesy of REUTERS/Baz Ratner.